Taking a Jeep off-road is kind of the point of owning a Jeep, right? The terrain you choose to tackle will determine your technique and equipment decisions. Likewise, you’ll need to research various techniques for each kind of terrain; navigating rocks is very different than maneuvering swamps. We’ll explain which equipment is the same, how it’s different, and ultimately compatible. No matter the model of your Jeep, similar modifications can be made that will serve you well on either mud or rock. A winch is a valuable asset. There’s a strong chance that if you’re stuck chassis-deep in mud or wedged between two vertical rocks, you’re going to be glad you have a winch to pull you out. Much like a winch, you’ll rest assured knowing you have assistance to get you past the obstacle you’re facing. A good spotter will help you see pitfalls in the path and forecast your route with better accuracy, saving you from problems such as getting high-centered or needing a winch in the first place. Stock lights are helpful, but extra lights on either the bumper above the winch or installed above the windscreen will be most beneficial when off-roading when the weather turns unfavorable, or if you find yourself out after dark. Upgrading each of these features is important for both mudding and crawling. Lift kits add extra clearance under the Jeep as well as providing a wider turn radius for larger tires. 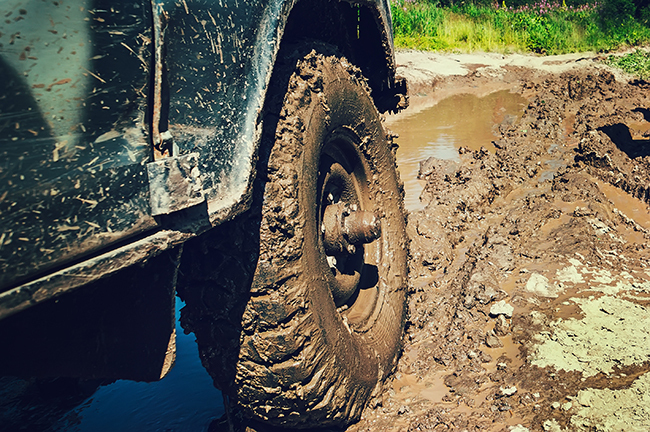 An upgraded suspension can take the brunt of the work in crawling while providing extra flexibility during mudding. Shocks absorb the impact of trail obstacles, especially when rocks are hidden below the murky surface. If you decide to lift your truck, you’ll have to do some planning. These are used for controlling the power of the engine and maximizing the low gears by transferring the power to the tires doing the work or to the tires that are touching the ground providing increased traction. You can read more about the right differential and locker for your Jeep. After an amazing day on the trails, you’ll want to clean the dust or mud off your rig carefully to avoid corrosion of the metals and contamination of fluids which could lead to bigger problems. There are various modifications necessary for the maximum benefit of taking your Jeep off-road in muddy conditions. This feature keeps liquids from seeping into the tires while under stress and pressure. It also keeps the tires on the rims during the bumps and scrapes that can take place below the muddy surface that can cause problems later. At a minimum, you’ll need a jack, tow straps and a shovel. Other valuable equipment includes tow hooks on the front and/or rear bumpers, and a snorkel for keeping the engine dry while going into deep water, swamps, or mud holes. Similarly, you’ll need an exhaust fording kit or smog pump to keep liquids out of the exhaust system. The rule of thumb here fluctuates depending on the model of Jeep you drive, but you’ll need to know how to deflate your tires for rock crawling (not necessarily for mudding). Deflating the tires to a range between 10-20 PSI will spread the surface area of the tire tread making traction greater. Bigger tires are not necessarily that helpful for crawling but, for mudding, they’re your best bet. Note that bigger tires will mean you need to install a lift kit to ensure that your clearance is maximized for both height and turn radius. You should always have spare tires, an axle shaft, wiring replacements, hubs, and u-joints. Play hard enough and you’re likely going to need one or all of these parts. It may seem like a lot to carry with you, but you’ll only regret it if you need it and don’t have it. With the inception of the electric disconnect dash button on the 2011 Wrangler Rubicon, disconnecting the sway bar has never been easier. The ability to disconnect will improve tire articulation which improves flexibility and stability while rock climbing. No matter which terrain you choose, you should be able to conquer mud or rocks with a little preparation and planning. And if you’re just getting started, check out our Off-Roading 101 for some basic tips. TireBuyer has an incredible selection of all-terrain and mud tires. Shop by size or vehicle, or give one of or tire and wheel experts a call at (800) 208-3153. If you’re going off-road, a winch is essential. Here’s what you should know before you buy one. You lifted your truck, but how will you and your passengers get in and out? Nerf bars and running boards to the rescue. You want to give your truck extra clearance, but with two lift options to choose from, your decision requires some thought.